Angry Birds game has been a big phenomenon and is being love by lot of people. Recently, Angry Birds game on Chrome found permanent home where any internet user can play this engrossing game for free. Angry Birds goodies keep rolling with latest offering being official Angry Birds theme for Windows. 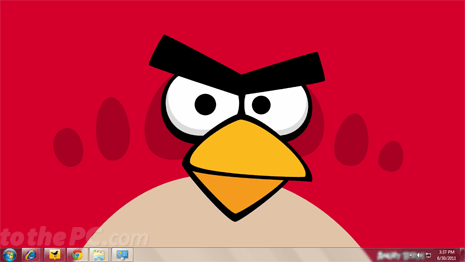 Any Windows 7 user can download official Angry Birds theme for free on their Windows PC. Birds are angry because their eggs have been stolen by pigs. They have no wings and want eggs back at any cost. While new seasons of Angry Birds have been released – this official theme release capture original looks of Angry Birds. 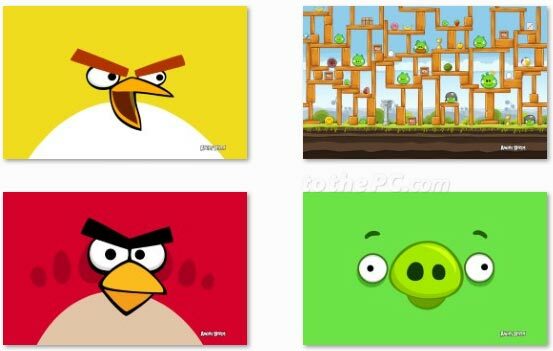 Theme package has 5 cool looking Angry Birds background wallpapers including: Angry Birds in red and yellow, Pigs happy and damaged and Angry Birds contruction view. Click here to download theme package for official Angry Birds theme for Windows 7. Just click Download link, extract package and double click “Angry Bir” file to preview and use theme on Windows 7 PC. This theme can only be used in Windows 7 Home Premium, Professional, Enterprise or Ultimate editions. If you love birds, then there are more bird based Widows 7 theme available for free download for Windows 7 users. Checkout Rio Movie theme, Birds of Prey theme and Beautiful Birds theme.